Our inventory of used fire tankers and water tenders for sale includes a variety of used water carrying firefighting apparatus. These used fire trucks are designed to transport large quantities of water to the incident scene for use in firefighting. In rural areas where hydrants are not present, used tenders and tankers are a necessity. These used fire trucks usually have a very low GPM fire pump to fill the tank. In some cases the truck may have a larger fire pump classifying the truck as a pumper tanker. If your department is looking for a tanker or water tender for purchase, please contact our sales team for assistance. 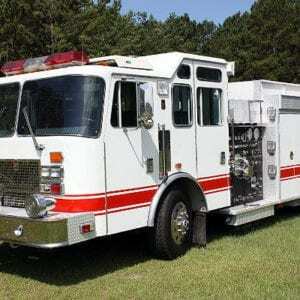 Please use the links below to view the specifics of each used pumper tanker, tanker or water tender for the individual used fire truck for sale. Our inventory changes often so be sure to check our website regularly for new listings of used fire tankers for sale by Fire Line Equipment, apparatus service, fire truck part specials and fire service industry news and updates related to firefighting apparatus.